February | 2011 | FBorFW Strip Fix For Better or For Worse Comic Strip by Lynn Johnston. Lynn's Comments: To continue with the family monikers: Rod and his younger brother, Ralph, were often called "Walph and Woddy" by their dad. It was what they used to call each other when they were kids and Tom still loved the sound of it. My brother Alan and I were "Alsy and Lindy". I was perhaps eight when I began to hate my nickname. I refused to come if someone called me Lindy and eventually my parents gave in and called me Lynn. These names weren't nearly as irritating as the names we called each other. My brother and I had nicknames that continue to this day - and I won't repeat them. We enjoy an affectionate and peaceful relationship and I don't want that to change! This entry was posted in Uncategorized on February 1, 2011 by stripfix. Lynn's Comments: Now that I have adult children, I can well understand our parents' constant reference to the past. In retrospect my own children were adorable, bright, funny and respectful. Most of the time. Set well into the recesses of aging memory are the times we would gladly have drop kicked them off a bridge and rejoiced in the sound of the SPLASH below! If I work at it, I can remember being so angry that I was completely out of control. Only escape, a heart to heart with a good friend and time would stem the rage, let me see the bright side and eventually cool me down. There is much to be said for having passed through the parenting phase and into senior citizenship. I have paid my dues and am enjoying the company of two children I'm proud to see productively out on their own. I consider them my equals - even though I remind them to eat well and keep warm and I call them "Beans and A.J." This entry was posted in Uncategorized on February 2, 2011 by stripfix. Lynn's Comments: Goodbyes are always hard for kids. Perhaps it's because they are focused on today; they don't think so much about the future. Even tomorrow is too far away! As adults we are aware of how fast time flies and how quickly the next event will take place - often long before we're prepared for it. My father's family came from Ontario one time to visit us in North Vancouver. I remember playing with cousins I hardly knew. We were just figuring out the pecking order when they had to leave - and their departure was "forever". We cried as if we'd never see each other again - and in truth, that was just about the case! Living so far away, our relationship was then by phone and greeting card. We didn't reunite and become friends until Alan and I left home and moved back to Ontario. Saying goodbye is easier now with email and Skype, but still...there's nothing like being within hugging distance of friends and family. This entry was posted in Uncategorized on February 3, 2011 by stripfix. Lynn's Comments: When I was about 14, my father's mother came to stay with us. My grandfather had died. She was recovering slowly and Dad thought it would be good for her to come and live with us for a while, since he and Mom worked full time at the jewelry store on Upper Lonsdale. Alan and I would have been "latchkey" kids by today's standards, but we were fine on our own. We had our routines. I made dinner and he stayed out of my way. When Grandma came, she upset the applecart by assuming my kitchen duties and my mother's role as well. She became another authority figure, which my brother and I really resented. To add insult to injury, she took my bedroom and I was given a corner in the unfinished basement - a space as famous for its spooks as it was for its spiders. After six long months, Grandma finally returned to Ontario. Al and I rejoiced and I did something I rarely ever did: I completely mucked out my bedroom. Even though she had gone, the essence of Grandma remained in the scent of her soap, her clothing and her dark-gummed dentures which she'd kept in a glass cup on my dresser. For some time, the smell of Grandma lingered in the halls and the living room. She was still there, even though we had the house to ourselves again. That incident was the memory behind this comic strip! This entry was posted in Uncategorized on February 4, 2011 by stripfix. Lynn's Comments: They say that "normal" means different things to different people. For us, normal morphed from one reality into another as the kids grew and changed and became individuals. When they were little, reality was toys - everywhere. Later, it was friends - everywhere - and the sounds of sports, music and video games. Normal didn't become tidy and organized and quiet until they both moved out. Then, normal meant projects and travel and missing them. I went to visit friends of my daughter's recently. Brooke and Matthew have twin daughters, six months old. The girls are just starting to toddle and their small living room is strewn with blankets and toys. Brooke apologized for the mess. I said, "Don't worry, relax - I understand. You have two little kids! ...This is normal!!!" This entry was posted in Uncategorized on February 5, 2011 by stripfix. Lynn's Comments: When my dad went to the dump, we always wondered if he'd bring home more than he left there. The North Vancouver dump was about 6 miles from home, then a circuitous drive down a long dirt road. Going there was as exciting as anything we ever did on a weekend and my brother and I would fight for the front seat when we saw the folks pitching stuff into the back end of the car. A great chain link fence ran around the "nuisance grounds" and the "dump man" would meet us at the gate. He'd roll his cigarette into the side of his mouth and ask what we were bringing in. Then he'd direct us to the appropriate space in the compound and Dad would steer the old green Volvo into position for the drop. After we'd made our deposit, we were free to check out the scattered offerings hoping to find some treasure. The smell of wet paper, burning fabric and decay was not too bad - considering the fact that stuff here was FREE, so we happily climbed over the rubble on our quest for the perfect thing to rescue and take home. Our shoes took a beating, but all for a good cause. The dump man was cool. He didn't have a uniform, but he had a sort of military air. He enjoyed his place of authority and the fact that dad brought him a beer now and then improved our chances of getting out with something big! The score I remember most was the goose-neck lamp that dad found. It was a sort of greeny-grey....brass, I think, and not too badly scarred from the fire. The cord and plug looked good and Pop figured this was just the thing to go on his workbench downstairs. Mom, of course, was unimpressed and quietly told me later that she expected it would be gone in a fortnight - if she had anything to do with it. Advance to the year they sold their house and moved to Hope. The lamp went too. When our parents passed away, there in the basement on Dad's workbench was the goose-neck lamp. It had followed them for 40 years and was now an heirloom. The trouble with heirlooms is...the heirs have to decide what to do with them. Alan and I thought about taking it to the dump, but we couldn't. Alan is retired from teaching, now and has a workshop in his basement. He makes one-of-a-kind kayaks. He has a nice workbench where he cuts the wood and copper, which he carefully sets into the sides of his kayaks... and, illuminating the workbench, is the goose-neck lamp. Going to the dump has lost its luster for us now, but our memory of Dad's "hunt for treasure" and the goose-neck lamp still remains! This entry was posted in Uncategorized on February 6, 2011 by stripfix. Lynn's Comments: For some reason, we lost a week of dailies. We looked in the archives, pulled out old negatives and checked the collection books--and still, six days out of this year were missing. After an exhaustive search, Kevin called and asked me to draw up a new week of dailies to fill in the space and keep the year's work on track. This is the week! I tried to do a series of spot gags that could be placed anywhere and ideas regarding kids vs. grown ups quickly came to mind. I introduced this by having Mike hog-tie Elizabeth (something I loved to do to my kids!) which meant he was bored and would soon be under the watchful eye of his mother. It was fun to do. I haven't had to produce new FBorFW material for a while, and I was surprised by how easy it was to get back into the routine. The trouble is--what used to take me a few hours now takes me a few days, and I was glad to have it "in the can" and off to the syndicate. This entry was posted in Uncategorized on February 7, 2011 by stripfix. Lynn's Comments: This year, I will be the same age as Charles Schulz was when I first met him. Cathy Guisewite ("Cathy") and I met "Sparky" Schulz in Washington. We teased him, singing "Will you still need me, will you still feed me--when I'm sixty four?" It was 1986. In 2011, it's my turn to be sixty four...and I'm looking at life through entirely different lenses! Sparky and I both enjoyed drawing the dogs in our strips. Snoopy was a magical fantasy character who could do almost anything, while Farley was just a regular mutt. These cartoon drawings were alive to us and eventually both Farley and Snoopy became frontrunners in our work. If they did not appear regularly, our readers would ask "why?" so it was important for us to invent ways to showcase them as often as possible. Farley allowed me to explore the goofy visual humor that a family pet provides. He was a pleasure to draw and when we had the opportunity to animate him, he was hilarious. Watching other artists "become" Farley as they made him scratch and roll, shake off dust, bark and run wildly in circles is something that makes me laugh every time I think about it. I am so grateful for my friendship with Sparky and for having known Bill Melendez, who animated Snoopy and all the Peanuts characters. I keep in touch with Judy Sladky, who is the magic behind Snoopy On Ice, and as a friend of Jeannie Schulz, Sparky's widow, I will soon be speaking at the Schulz Museum in Santa Rosa with Jan Eliot, who does "Stone Soup". This will connect me again to friends in the industry and remind me once more...that I'm a very "lucky dog!" This entry was posted in Uncategorized on February 8, 2011 by stripfix. Lynn's Comments: When I was a kid, we had a dark maroon vacuum cleaner. My mother, having given in to anything "safe" that would keep us occupied, allowed my brother and me to roll marbles down the hose into the basement. We advanced from marbles to Plasticine "heads" which we chopped off Plasticine bodies on a guillotine made from Tinker Toys. Coins, buttons, stones and gumballs took the plunge and if recovery at the bottom didn't happen, we waited for an outpouring of angst from mother the next time she tried sucking chalk and cereal off the carpeting. The exhaust end of the vacuum was another source of entertainment. We tried to inflate balloons, kitchen gloves, and the bulb on the turkey baster--imaginary missiles we hoped to inflict on the neighborhood. Those were the days! Drawing images like this brings back some fine childhood memories and makes me wonder once again why our parents allowed Alan and I to progress into adulthood. 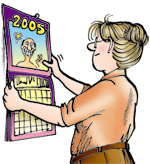 This entry was posted in Uncategorized on February 9, 2011 by stripfix. Lynn's Comments: The vacuum hose on the stairwell also provided my kids with a diversion. I taught them what to do! I mean, indoor activities that don't involve fast food and television are hard to come up with and usually require adult involvement. Rolling stuff down the vacuum tube is harmless and relatively noise free entertainment. I let them play with this set up whenever they couldn't play outside and anything that would roll down the pipe without clogging it was OK with me. I just drew the line at liquids and frozen peas. Cleaning up at the end of the day was an easy price to pay for the peace it provided... besides, I knew what they were doing and where they were. The stairwell we used as kids went down into our basement. The one my kids played on sent everything into the living room. This made for some hide and seek thereafter and although I made a thorough search for marbles and the like, I kept finding residual rolling stock until the day we moved away. This entry was posted in Uncategorized on February 10, 2011 by stripfix. Lynn's Comments: Bedtime--I mean the exact time our heads hit the pillow--was a contentious issue for my brother and me. Being two years older, I felt I should get at least an hour more of "up time". Mom thought otherwise. Because we had to share a room, it wasn't possible to put one over on him, either. Both Alan and I knew exactly what the other got or did or had and the competition for MORE was fierce. We fought constantly. If it wasn't over who got what, it was about who said what and when and the grating repetition of "It's not FAIR!" made my folks' heads spin. I remember being caught watching television from our vantage point in the hallway and my punishment was that I was sent to bed even earlier the next night. NO FAIR! I could never understand why an hour more was such a big deal. Why couldn't I watch one more show or do one more thing? Why did my parents insist that an eight o'clock bedtime was so important? WHY??!! Years later, I had children of my own. By eight o'clock, when I was at the end of my proverbial rope, I made eight o'clock the set bedtime--no arguments, please. It's interesting, isn't it, that we repeat familiar routines and much like the fish in the ocean we return to familiar waters, and we do it to assure the survival of the species. This entry was posted in Uncategorized on February 11, 2011 by stripfix. Lynn's Comments: If I can't sleep, I will often turn the radio on to the CBC. The droning of interviews, the endless ardent and erudite guests--from the Netherlands at night to the UK in the morning--send me into a haze unequalled since high school. When a lecture was lengthy and the room was warm, I slept easily sitting in a hard wooden desk with my head on a textbook. I didn't mean to drift off. I don't now. In fact, I'm a very good listener and I care! It's just that sometimes I can't concentrate on or absorb what's being said and then, the sound of the speaker becomes like the hum of an aircraft engine and I just fly away. I guess the good thing about this is; I can detect the same somnolence in others. I have learned to recognize the glazed eyes the controlled expression and the stifled yawn and I know that it's time for a break or a change of subject. I see it, I recognize the feeling and I relate to the individual...I just hate it, however, if they've been sitting there, listening to ME! This entry was posted in Uncategorized on February 12, 2011 by stripfix. Lynn's Comments: The taboo subject of weight was hardly ever brought up in our house. The question "do I look fat in this?" was incendiary. Even at my most svelte, I still considered myself sofa-sized. With a comic strip to get out and personal baggage to exploit therein, I often drew Elly large-nosed, slumped over and bottom heavy. It was OK to do this. As long as I was critical of myself, the household ambience remained stable. Should someone ELSE deliver the blow, however - even as a joke, I was instantly rushed back in time to my moody adolescence when image was everything and a full length mirror dangerous to one's health. When Rod saw this strip, he announced; "That's not funny!" Sometimes the truth is stronger than friction. Later, when I no longer used fanciful images of flying objects, I explained to curious readers that this was how I felt at the time, and not something I actually did! Now, at the ripening age of 63, I'm no longer as obsessed with my waistline as I was then. I've gone beyond wanting to look like one of those angular sylphs in the catalogues. I'm comfortable with the way I am. I'm at ease with the woman within. I'm able to look at myself objectively and positively with confidence and cool. But ...should anyone joke about my wrinkles... WATCH OUT!!!! This entry was posted in Uncategorized on February 13, 2011 by stripfix. Lynn's Comments: I have just returned from a dental appointment. It's fun to see that despite the many clinical innovations, some things never change. My hygienist talked pleasantly about her holidays as she scraped and prodded, trying not to say anything that required an answer...and later Peter, my dentist, did the same. Keeping your mouth open (rather than shut) is easy as long as the topic of conversation is middle of the road...but once a good volley of wit begins, the situation becomes a struggle. Living in Lynn Lake, where we knew virtually everyone, meant some social repartee. Patients expected their appointment would include both a check up and a check in - to what had transpired since their last visit. Everyone had a connection to us somehow, either through my parents-in-law or through Rod's early childhood, so it was hard to end a personal exchange and simply cut to the chase. My mother was one of our first large case patients. She required a load of bridgework and was, naturally, interested in the whole process. She had been given as much information as possible, but even with anesthetic swabs, and suction in her mouth, she was still asking questions. We did not have an assistant at the time, so I was the one handing the instruments back and forth. With family close at hand, Mom continued to talk until the Nitrous Oxide unit was strapped to her nose and turned on. Within, a minute or two she became quiet, mellow and relaxed. She breathed in the gas and exhaled a long, appreciative sigh. She had a goofy open-mouthed smile and her eyes twinkled as if she was half dreaming about something wonderful and far away. Over the next several hours, she said nothing and the work went well. I had never before seen my mother blitzed or blissed-out and when it was all over, I resolved to say little about how much she'd enjoyed her trip and how much we had loved the quiet! This entry was posted in Uncategorized on February 14, 2011 by stripfix. Lynn's Comments: Aaron's "punch lines" were a gift. He would unwittingly change an expression or a turn of phrase that would then become part of For Better or For Worse. Kids say funny things all the time, but some are just prone to word play and Aaron trumped them all. There were times he would be "let off the hook" if his remarks got a laugh and I had to be careful not to encourage him too much or the discipline we managed to instill would go whizzing down the drain. Aaron wasn't the only one to add to the comic strip dialogue. Other family members did, too. 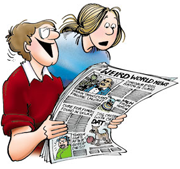 The problem was that it wasn't always the funny remarks that wound up in the "funny papers." Sometimes the serious ones did, too. It wasn't uncommon for me to have a tense exchange with someone and after everything was resolved, I'd hear a threatening: "You'd better not put that in the strip!!" This entry was posted in Uncategorized on February 15, 2011 by stripfix. Lynn's Comments: In my life, I have purchased a goodly number of items which include operating instructions. I now know that it is not in us to read them. No. It's more important to try and figure out how the thing works or how to put it together than to waste time on "important information enclosed within". I think this is because we are all perfectly capable of operating, using, wearing, applying or cooking whatever it is without any advice from you, thanks very much. Last week, I bought an outdoor thermometer to attach to my kitchen window. It was a plastic ruler-like device with the image of a blue jay in the middle and a suction cup at each end. I took the thermometer out of the package, ditched the instructions, went outside and dutifully wiped the surface of the window clean. Any idiot knows you have to clean the "receiving surface" first. The only thing left to do was to center the thing where I wanted it to go and push! I placed the thermometer on the window, pushed it to engage the suction and SNAP! The damned thing broke in the middle...right through the beak of the blue jay. Bummed and babbling things I won't repeat, I went inside, pulled off the cups, tossed them into the what-not jar and fired the remains of the thermometer into the trash. A funk ensued. I whipped the instructions off the counter to see what, if anything, I could have done wrong. With a simple diagram and wording in both official languages the page clearly stated: Do not press thermometer in the middle. It will break. Press only on suction cups at either end. Hah! Stupid, dumb thermometer. I didn't like it anyway. The blue jay, for one thing, was corny and the whole thing looked cheap. I went back to the store and bought another one. A better one. And, this time, I read the instructions. This entry was posted in Uncategorized on February 16, 2011 by stripfix. Lynn's Comments: I confess. My kids had far too many toys. I wouldn't have called them spoiled, although I know they were...it's just that I love toys so much myself! The year that Rod and I were married, he moved into my house in Dundas. The garage was small and in order to make more room, we had to get rid of a few things - one of which was an original dime-operated Coke machine; a thing of beauty that my first husband had fought for, won and abandoned. Reluctant to let it go, we decided it would not be sold at a bargain price. Whoever wanted our Coke machine would have to make it worth our while. In those days nobody had much money, so when word of mouth brought us our only candidate, he was unable to give us more than 50 bucks. He was, however, an employee of Mattel - the big toy manufacturer and he threw into the pot an invitation to the annual Mattel staff Christmas sale! SOLD! The day we went to the big Mattel warehouse will forever live in memory. It was enormous. Barbie was still a big item as were all her pals. There were stuffed toys and baby toys and toys you could ride on, slide on and build. There were dolls and doll houses and tea sets and miniature kitchens and musical toys and child-sized furniture and you could have any of them in bulk and at prices we couldn't resist. Rod and I went crazy. We bought so many toys we could hardly stuff them into our small yellow Datsun. As we drove home, we regained our composure. The toy-fiend gratification gradually wore off and we wondered what we had done. We had one small boy to provide for, so what were we going to do with Barbie stuff? What were we going to do with everything we bought? We'd spent far more than the 50 bucks we got for the Coke machine! Without letting Aaron know that his parents had gone berserk, we hid our load in the attic. We gave away Mattel gifts at every opportunity. Everyone we knew who had a child received something from our stash. We were still giving stuff away as we moved to Lynn Lake and Katie received Barbies as soon as she knew the word "doll". I'm still a toy enthusiast. I love toy stores and an invitation once to the big toy fair in New York was toy heaven! I try not to buy anything. I don't need anything and in my house, I don't have space. Someday, however, should I ever become a "granny" I'll be shopping again for toys...but I won't be buying them for my grandchildren...I'll be buying them for ME! This entry was posted in Uncategorized on February 17, 2011 by stripfix. Lynn's Comments: I told you about this carving. I did buy it and it went down to the basement where it remained hidden and neglected for years. When Rod was looking at retirement hobbies and decided on model railroading, we made an "office" in the section of the basement where the freezer and the nuisance stuff was stored - and the carving surfaced again, to be sold at my mother-in-law's yard sale. This entry was posted in Uncategorized on February 18, 2011 by stripfix. Lynn's Comments: In Hamilton Ontario where I once lived, there was a curio shop which carried some of the most wonderfully hideous treasures I have ever seen. There were gold painted plaster statues, gaudy lump-covered lamps, plastic chandeliers, mass-produced paintings of deer beside waterfalls and copious decorative dust collectors of all shapes and sizes. One day, I saw in the window a huge image of the Virgin Mary. She was plastic and spray painted with garish blues, pinks and gold. Her hands were down at her sides, the palms open to the onlooker and she stood in a wide, deep, ornate plastic basin. Around the edge of the basin were a number of small metal "jets". She was a fountain, about 3 feet high. The best part was that from inside the base, sprouting up from beneath her feet were hundreds of tiny fiber optic tubes which formed a sort of glittering nest from which she rose. I was mesmerized. I went inside and asked the proprietor if I could see the Virgin in action. He complied. A small switch on the fountain's side made the water pour in small arcs into the basin. The fiber optic twinkling "bush" revolved about the Virgin's body and "Ave Maria" played on a music box from somewhere inside. She was marvelous. He explained that she was one of a kind, but that I could purchase her if I wanted to. I wanted to. I wanted to take her home and show her to everyone. I also wanted to give her to the right person - but I didn't know anyone who would truly appreciate this objet d'art as much as I did. Friends of ours were getting married. They were good sports and for a few moments I thought about how they would react if I gave her to them as a gift. I imagined them opening her up and trying to thank me for something they would never have imagined getting. The thing is - I liked them too much to do this to them, so I passed. It was too bad. But, at $300.00 she was also too expensive and so I abandoned her to the store window, wishing I'd at least had a photograph. I do have a mental picture, however, which is undoubtedly better than owning her. This entry was posted in Uncategorized on February 19, 2011 by stripfix. Lynn's Comments: My mother used to nag me constantly! Seems there was always something better to do than play or draw or watch television. The way I saw it, my room was my room and if I had to climb over a Vesuvius of moldering junk to find the bed I slept in, then that was my problem. Clean and ironed clothing was not a priority, nor was washing behind bodily protuberances. I longed for the day when I could do what I wanted to do, eat what and when I wanted to, have my own space, my own money and my own rules. That didn't happen until I was 20 and married for the first time. Then, I amazed even myself. I became a stickler for cleanliness. My apartment was spotless. Clothes were immaculate, ironed and sorted into their exact compartments. The bed was made, the carpets lint free and the kitchen was a neat, organized workspace. It wasn't until I had children that I realized what a degenerate slob I had once been. Hovering over my son as he miserably shoveled the crud out of his bedroom, I could hear myself nagging...with the same tone of voice, using the same language my mother used. Time and time again I promised myself I would not turn into my mother and here I was saying the same darned things - with the same predictable response. Years have flown by. Both of my children have homes of their own and it amazes me to see that they live in clean and tidy environments. I guess, in the end, nagging pays off. My mother, had she lived to see this day, would have been both proud and vindicated! This entry was posted in Uncategorized on February 20, 2011 by stripfix. Lynn's Comments: We got a new fridge shortly after moving north. I ordered it from the Sears catalogue - which was the one stop shopping for everyone living in the "boonies". Everything came by train or truck and often took weeks to materialize. Clothing was always a risk - just because we all went to the same functions and were often caught wearing the same things. My new fridge was a beauty. I organized everything inside and put some colourful alphabet magnets on the door in preparation for the photos, notes and doodles I looked forward to hanging there. Kate, who was toddling and full of mischief, saw the magnets and before I could stop her, started to "scrub" them around, scratching the surface of my new fridge. I had only had it one day before it was "broken" in - and I was broken hearted. "Not sweating the small stuff" was hard sometimes! This entry was posted in Uncategorized on February 21, 2011 by stripfix. Lynn's Comments: The invention of the plastic container has given us the opportunity to save our leftovers until they are no longer a palatable alternative to fresh fare. At this very moment, I have three such containers waiting for consumption or compost...and since it's -20 degrees C outside, my guess is...I'm looking at guilt and garbage for at least one of them. Now that I think of it, I have several half finished jars of jam, an opened bottle of wine circa Sept. 2010, mustard that has no discernable label and a jar of beets I think I bought last spring. I also have fresh stuff I should deal with - and I will, today, most likely.... but as luck will have it...I've been invited out to lunch. This entry was posted in Uncategorized on February 22, 2011 by stripfix. Lynn's Comments: I am 10 lbs overweight. This is normal for me. I feel best, most confident and most comfortable when I am close to the weight I want to be...but I like eating, more than I like being 10 pounds less. So, I have my fat duds, my intermediate and my thin clothes in a closet that needs purging more than my fridge does. I have jackets with shoulder pads bigger than Napoleon's and pants that went out on the ark. I have sweaters my mom made for me and at least one caftan that's never been worn. Let me explain the caftan: it's from the Middle East somewhere, is lovely and can't be parted with. I'm saving it for the day when I no longer care about the 10 lbs, no longer have a size-optional wardrobe and am luxuriating in the comfort of food. I just hope my taste buds are the last of my five senses to go! This entry was posted in Uncategorized on February 23, 2011 by stripfix. Lynn's Comments: This was my mother's argument. The suggestion that she and I had more efficient metaboli and were therefore able to retain more of the nutrients we consumed was supposed to make us feel OK about weight gain. My dad and my brother didn't have to think about this. They burned off everything they ate! We were fortunate, she said. If she and I were ever marooned on a desert island with a group of people and little food, we would outlive everyone who needed to eat more than we did. At the time, Gilligan's Island was a popular TV show, so this scenario was easy to imagine. The thought of my mother and I being the last survivors, however, made me less than grateful. We were two strong characters, always in competition, and this would have pit one of us against the other. If it came to "dog eat dog"... I'd rather have been the one on the skewer than the one doing the roasting! This entry was posted in Uncategorized on February 24, 2011 by stripfix. Lynn's Comments: Katie was getting to be quite independent and was an easy kid to live with. My friend Marian across the street had her a lot of the time - having raised three boys, she loved having a little girl around and enjoyed looking after her. Aaron was in school, so I toyed with the thought of adding to the family. After some intense discussion, we decided that two was enough, but I still wanted the experience - so Annie, in the strip, got pregnant! This entry was posted in Uncategorized on February 25, 2011 by stripfix. Lynn's Comments: With this new element of interest to work with, I put myself right into Annie's shoes and examined all the thoughts I might have if the tables were turned. I would have been excited, happy, fearful and anxious all at once. Even with help close by, having another baby is a decision which changes everything and should be carefully planned, if possible. I also knew a lot about Annie; things the readers didn't know. I knew that she had her hands full and that her husband was serially unfaithful - something she suspected but didn't want to know. It was challenging to write about and draw people in an ordinary neighborhood, dealing with ordinary things. It made FBorFW come alive for me - and so much more interesting than if it had been static and everything had remained the same. This entry was posted in Uncategorized on February 26, 2011 by stripfix. Lynn's Comments: When the kids were small, the work involved often filled a day. By suppertime when laundry, cleaning, shopping and meals were done, I wondered where the time had gone. It wasn't until the dishes were done and the kids in bed that I could sit down - without guilt - and enjoy the paper. It's amazing how "invisible" a housekeeper's job is! For those who share the home and enjoy the fruits of "Mom's labor" things like clean clothes folded neatly in drawers, a tidy, sanitary refrigerator, vacuumed rugs, washed floors, swept and organized closets, prepared meals, answered mail, full toilet roll holders and all the other myriad details that go into running a home seem to occur like magic. If you don't see or take part in the process, you just accept it and expect it all to be done for you. In fact, unless something is NOT done, you don't notice it at all! This revelation came to me when I hired a housekeeper. My sweet lady would come one day every week. I'd leave things for Janet to do. After awhile, dusting and ironing and clean floors just "happened". Recycling was done, mats were shaken and shelves were wiped clean...and if I wasn't there to have a coffee with her and see her work for myself - I took my clean house for granted! Being a "housewife" is a full time job. Add parenting to this and you have an all- encompassing career - for which many of us apologize! I was lucky enough to have a job that allowed me to work at home. I had two jobs! Strips like this one were done to support all the smart, productive and caring moms I knew who were struggling to stay sane. These comic strip complaints also made me less resentful of my own responsibilities. It felt amazingly good to confide my feelings to an unseen community of friends...millions of them!!! This entry was posted in Uncategorized on February 27, 2011 by stripfix. Lynn's Comments: After he'd grown out of them, I did hang on to Aaron's crib, playpen and high chair - with the hope that I'd use them again someday. When Katie came along, however, I had in-laws who loved to spoil her and a job that allowed us to be a little less cautious with our cash. She had new things - which, in a way, were less exciting than the things I'd bought on a shoestring and had fixed up myself! These I later sold or gave away when we moved north. I am not one to keep things - even if I think I might have a later use for them. I give stuff away or send it to the second hand shops and sometimes I'm sorry for having done so. When my kids were little, I gave their clothes to friends who promised to give them back to me later - but this never worked out. Either the clothes came back ruined or not at all. I gave away some beautiful things and am grateful for the photos I have of Kate and Aaron dressed in their best; an image that lasted for a few hours, if I was lucky. I did manage to keep their favorite baby blankets. They are lovingly stored in a cedar chest along with three quilts, which were made by hand by friends and are therefore priceless. Some things you have to keep...for no real reason at all!! This entry was posted in Uncategorized on February 28, 2011 by stripfix.